The cadillac or trapeze table was originally a hospital bed equipped with springs through which patients could mobilize arms and legs against resistance while they were technically still on bed rest. Today, we know that early mobilization in a gravity lessened environment can help to fast forward rehabilitation progress and stimulate neuromuscular re-education. The Pilates Reformer is perhaps the most well-known piece of Pilates equipment. In essence it is a sled with spring attachments, ropes, and straps. The spring resistance can assist or resist muscular patterns in order to facilitate neuromuscular re-education. From humble beginnings as bedsprings were attached to a wheelchair, the modern Pilates Chair is used in a repertoire of exercises that is only limited by the scope of your imagination. 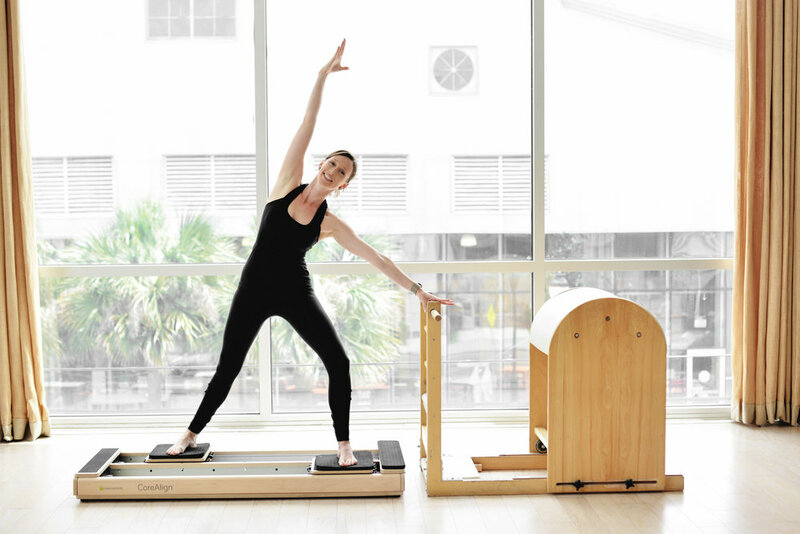 While not technically a piece of Pilates equipment, the CoreAllign was developed by Balanced Body Pilates to bridge the Pilates repertoire of exercises into standing movement patterns. You could think of the CoreAlign as two small reformers for your feet.